Book Summary: Get caught up on all things Jean Grey with these Marvel Primer Pages and then check out the start of Jean in Marvel Legacy in Jean Grey #8. This is just a simple brief run-down on why young Jean Grey is trying to fight off her fate of becoming consumed by the Phoenix. It is really nothing special. In fact, I recommend you skip this and pick up the Jean Grey comic. 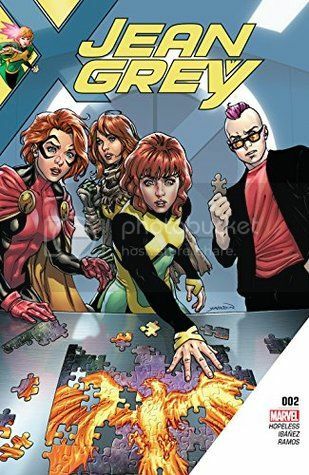 Book Summary: Teenage Jean Grey is willing to do whatever it takes to avoid the fate that befell her predecessor. But when Jean is cast through time and comes face-to-face with the newly possessed Phoenix, will she find the key to saving herself…or learn that her fate is sealed? 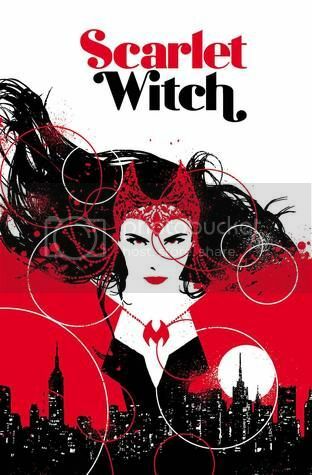 Book Review: Teenage Jean Grey finds herself in another world. Here as she trudges through throngs of beach-goers, she finds the older version of herself enjoying a good book as she suns herself. For the young Jean Grey, seeing an older version of herself is unsettling and even more with the Phoenix force hovering just above her. As the raptor-like bird disappates into nothing, the older Jean Grey is distracted by the arrival of a male, who tries to strike up a conversation with her. Unfortunately, older Jean is not interested in any way and sends of the male off. She, then, turns to the younger version of herself. Older Jean does not quite seem so happy to see her younger self. It is at this point the younger Jean starts bombarding her older self with questions but the older version doesn't answer them right away. Instead asks younger Jean if she would like something to eat. The two end up at a resturant and then at a dance club. It is here where older Jean finally offers to give her younger version a taste of what the power of the Phoenix force. The two head into space and to a world that is currently in chaos where its inhabitants are fleeing in terror from Galactus and his herald. Of course, Phoenix steps in to stop Galactus from devouring the world but it ends up taking both Jeans in stopping him. For younger Jean, this still makes her resolve in destroying the phoenix force stronger especially since the older version of herself really has no idea of the corrupting powers she has coursing through her veins. And even before younger Jean can really offer any sort of answer to older Jean's inquiry, the Watcher appears and sends young Jean away. This issue was awesome! Younger Jean had a chance to see exactly what the Phoenix force was capable of - life saving. Of course, younger Jean still has it fresh in her mind of the darker aspects of what the force is capable of. So seeing the two versions of Jean together was a real treat! I am hoping that this is the beginning of the revival of older Jean. I would love to see her come back to life and perhaps be there when the Phoenix force comes for her younger counterpart. Or perhaps the Phoenix may not even be coming for the younger Jean. Maybe it could be coming for the older? Now that would be something! Book Summary: The arrival of the original X-Men in the present sent shockwaves through the Marvel Universe, but we've only seen the effects on Earth - until now! When an alien race discovers that Jean Grey, host of the destructive Phoenix Force, is back on Earth, they decide to hold her accountable for the heinous acts of Dark Phoenix! 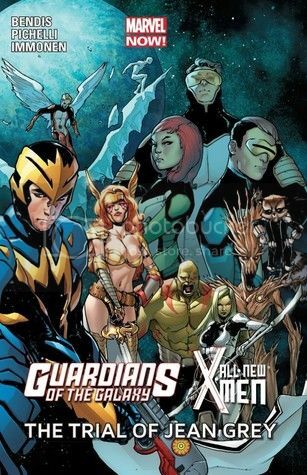 Now it's up to the spacefaring Guardians of the Galaxy to help the all-new X-Men save Jean Grey from twisted intergalactic justice! A surprise ally from one character's past comes to help, but is that enough against the most powerful army in the Universe? 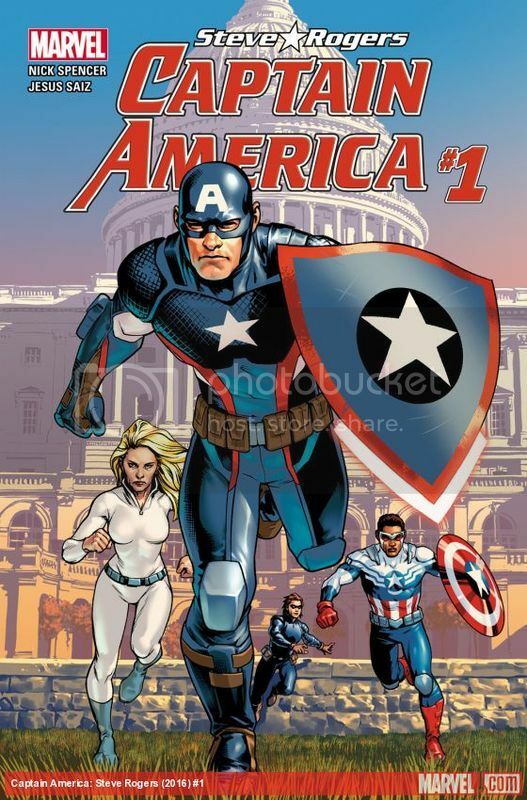 You won't want to miss the first encounter between two of the biggest franchises in the Marvel Universe! Gladiator of the Shi'Ar Empire has learned that Jean Grey - perhaps the future host of the Phoenix Force - has come to future and decides that she has to answer for the crimes of the other Jean. He kidnaps her and takes her back to the Empire to face charges of the crimes that have yet to be committed by this Jean. The X-Men must team up with the Guardians of the Galaxy and free Jean from a fate she has not even been a part of. This was a nice anthology read. You have to feel sorry for this Jean because she is being accused of something that hasn't quite happened to her yet and here she is being placed into the same bubble as the original Jean herself. I am sure that now that she is aware of her crimes she will do whatever is necessary to change her course in the scheme of things but one must always learn that one cannot fully escape your fate nor the Phoenix itself. So this pretty much sets up the upcoming comics (including Jean Grey's own series) dealing with the knowledge of what she has done or very may well do in the future. I was also happy to see the Star Jammers as well as the Guardians. It was nice to have another two teams join in the prison break of Jean. I thought the scene between Scott and his father was a nice touch. It was too bad it was a bit short. I would have loved to have seen a bit more interaction between them and perhaps even a chance at some sort of reconcilation between them. The scene did nothing really to bring the two to some sort of conclusion. Who knows maybe we will see Scott and his father meet again in the future. This series also gave hint to a relationship coming between Kitty and Peter. Of course I had been a fan between Kitty and Colossus and this could easily change. I am quite aware that things have long since moved forward from here between the two and I will eventually read the comics to them. Overall, I enjoyed this anthology. It was nice to see everyone and yet see the scope of Jean's struggle as she tries to understand it all. She is still young and eventually she will have to figure out exactly how she is going to try to change her fate but she is also going to have to face her greatest fear - the Phoenix force itself. 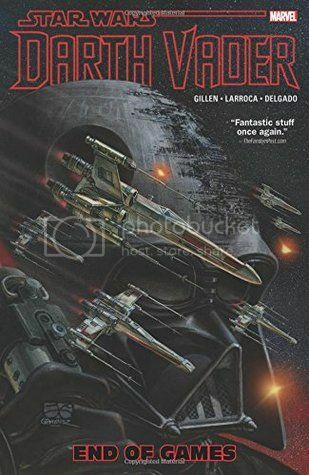 Book Summary: Darth Vader has been secretly pursuing his own agenda, but now it is time for the End of Games. As Inspector Thanoth returns with some startling information, it seems that Vader may have passed his master's tests. But even after finding favor in the eyes of the Emperor, the Dark Lord's schemes may yet prove his undoing... Plus, the killer droids Triple-Zero and Beetee wreak havoc in their own homicidal adventure! Marvel's in-depth exploration of the Dark Side of Star Wars goes from strength to strength! 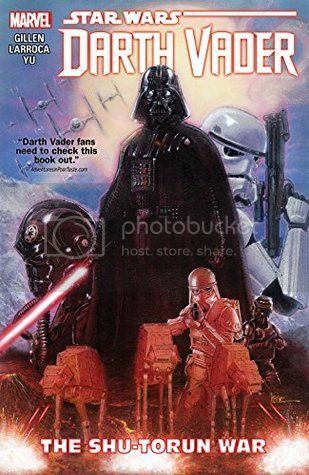 This books ends with the last several issues of the comic series, Darth Vader. The droids, Triple Zero and Beetee, have been sent out to capture Doctor Aphra. Once she is captured, she decides it is time to tell exactly what Vader has been secretly doing behind the back of the Emperor. Vader returns to Palpatine and learns the reason behind everything. As a Master/Apprentice, Palpatine wanted to make sure that he had chosen the right person to turn to the Dark Side of the Force. He believed that by orchestrating all of this, he believed by teaching Vader that Vader would not disappoint him in the least. Of course, Vader delivers and Palpatine believes he has become what he has desired in an Apprentice. Cylo has escaped and Palpatine sends Vader once more out on the mission to destroy him. Vader does exactly what he was told to do and destroys Cylo completely but not without complications. Vader is captured and deactivated. Or at least what Cylo believes Vader to be. Unfortunately while "deactivated", the Sith inside him destroys any remains of his humanity before regaining control to destroy Cylo. When Vader returns he finds that Alphra has made the Emperor's acquaintance and this displeases Vader immensely because he does not want the Emperor to know of his side plan to find Luke. Of course Alphra does not tell and the Emperor is even more proud of Vader building up his own army, but Vader is still displeased by this act of betrayal. He has her follow him where she tells him that she did not tell the Emperor of his little side job of trying to find Skywalker. Still, Vader is displeased that he pushes Aphra into an airlock and sets her out into space. Think that was the end of Aphra? Think again. She is rescued by the two homicidal droids and the Wookie Bounty Hunter. As for Vader, he goes to Tatooine and while waiting for two Bounty Hunters, he destroys an entire village of Tusken Raiders....or he so thoughts..? 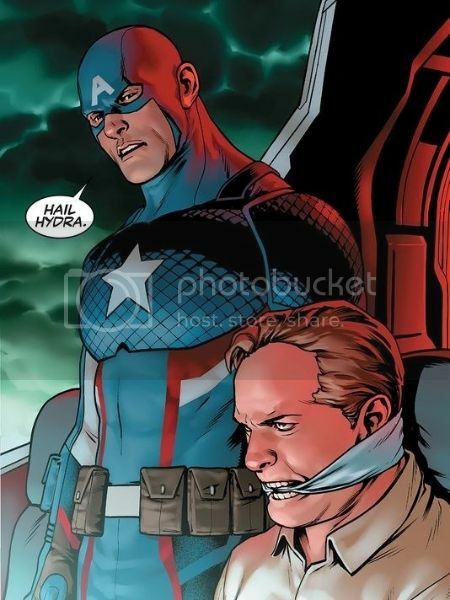 This was the perfect ending to the series. It was nice to see the change in Vader between Episodes IV and V. To see him destroy the last remanents of his humanity was interesting. I never thought he would resort to something like that but maybe he didn't entirely kill it off as it does appear once more in Episode VI. Maybe at the moment, he thought he had but those moments with Luke might have brought that part of him rearing back to life. I would love to see this series continue inbetween Episode V and VI. It would be interesting to see what exactly he was doing there too.